In order to use this layer you must install mu and mu4e separately. Typically mu4e will be bundled with mu (this is the case on many Linux distributions). Then add this layer to your ~/.spacemacs. You will need to add mu4e to the existing dotspacemacs-configuration-layers list in this file. Configuration varies too much to give precise instructions. What follows is one example configuration. Refer to mu4e's manual for more detailed configuration instructions. The maildirs extension adds a list of all your maildirs to the main mu4e view that by default shows the unread and total mail counts for all your mail under your base mail directory. This extension is enabled by default, you can deactivate (and uninstall) it by adding the package = to your dotfile variable =dotspacemacs-excluded-packages. ;; Under each account, set the account-specific variables you want. The first account listed will be the default account, so variables like user-full-name, which is used by other parts of Emacs, will have their value reset for the default account after sending each email. and then actually set mu4e-account-alist later in dotspacemacs/user-config. Make sure you call mu4e/mail-account-reset afterward, which will initialize the given account variables. If you have mu 0.9.16 or later, you can use mu4e's built-in contexts feature instead (see mu4e's manual). 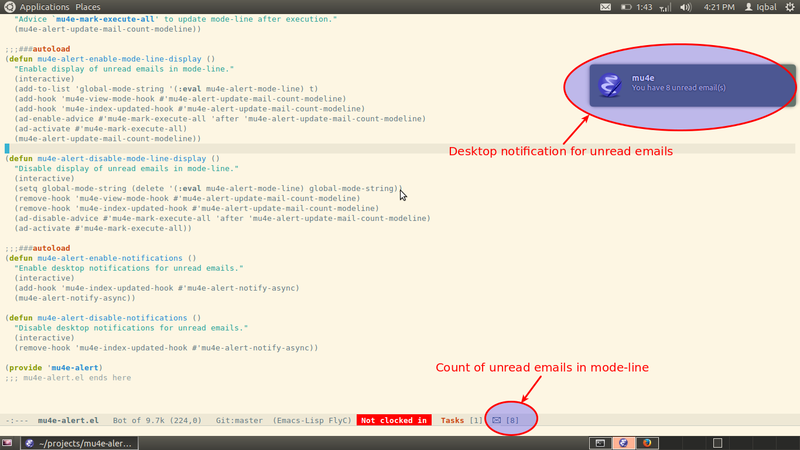 mu4e-alert is an extension that provides desktop notifications and adds the count of unread messages to the modeline. Refer to the official mu and mu4e documentation for additional info.